Martello towers were inspired by a round fortress, part of a larger Genoese defence system, at Mortella (Myrtle) Point in Corsica. The designer was Giovan Giacomo Paleari Fratino (el Fratin), and the tower was completed in 1565. Since the 15th century, the Corsicans had built similar towers at strategic points around the island to protect coastal villages and shipping from North African pirates. The towers stood one or two storeys high and measured 12–15 m (39–49 ft) in diameter. They had a single doorway five metres off the ground that one could access only via a ladder which the occupants could remove. 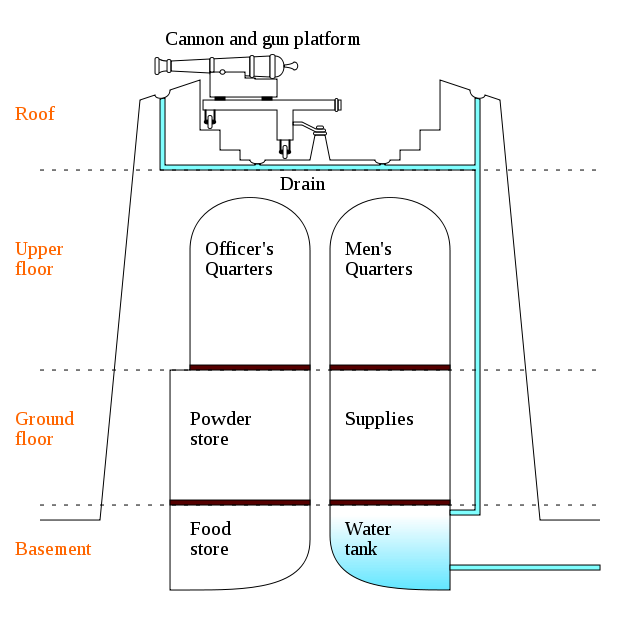 The towers were about 40 feet (12 m) high with walls about 8 feet (2.4 m) thick. In some towers the rooms were not built in the centre, but more to the landside, leaving the walls thicker on the seaside. This is the consequence of a very unlikely attack by cannon from the landside. Entry was by ladder to a door about 10 feet (3.0 m) from the base above which was a slotted platform which allowed for downward fire on attackers. The flat roof or terreplein had a high parapet and a raised platform in the centre with a pivot for a cannon that could traverse a 360° arc. Some towers were designed to carry more than one gun, with each having a more limited arc of fire. The walls had narrow slits for defensive musket fire. The interior of a classic British Martello tower consisted of two storeys (sometimes with an additional basement). The ground floor served as the magazine and storerooms, where ammunition, water, stores and provisions were kept. The garrison of 24 men and one officer lived in a casemate on the first floor, which was divided into several rooms and had fireplaces built into the walls for cooking and heating.The officers and men lived in separate rooms of almost equal size. During the last period of British occupation (1798–1802) of Minorca, General Sir Charles Stuart, the then British governor, ordered Engineer Captain Robert D´Arcy to build some 12 Martello towers along the coast. These, when added to the three Spanish towers already in place, gave Minorca 15 towers. The British built five towers to protect Mahón: Phillipet on Lazareto Island, Cala Taulera (St. Clair) and Los Freus (Erskine) on the peninsula of La Mola, Stuart's Tower, and a tower on the Punta de Sant Carlos, which the Spanish destroyed when they took regained possession of Minorca. To the northwest of Mahón the British built two more towers, Sa Torreta and Sa Mezquita. One tower, the Princess Tower, or the Erskine Tower, was incorporated into the Fortress of Isabel II, built between 1850 and 1875. 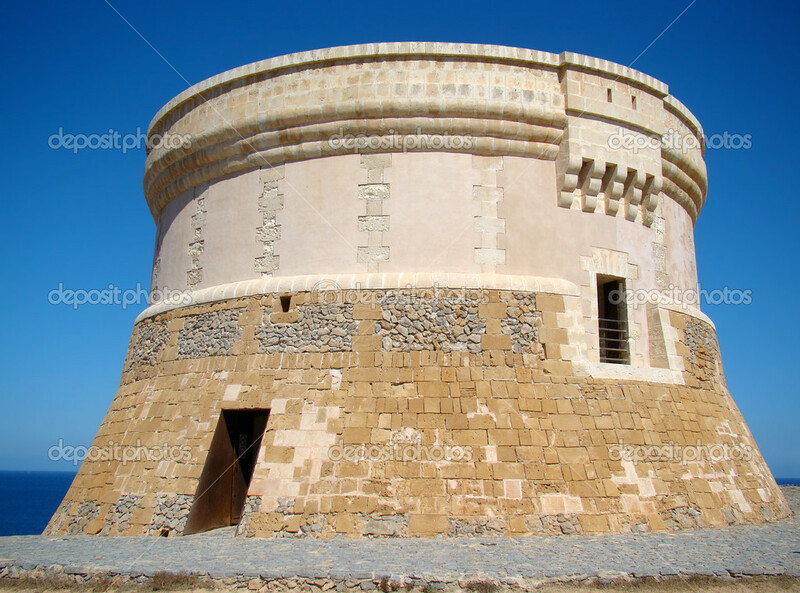 The tower was converted to a powder magazine, which led to its destruction in 1958, when lightning struck the tower. The explosion destroyed the tower, blowing out large sections of its walls. The British erected Stuart's Tower in 1798 on Turks Hill or Hangman's Hill to the south of the port of Mahón at San Esteban (Saint Stephen's bay) on the southern side of the Fortress of San Felipe. In 1756 and again in 1781, batteries on the hill had supported successful attacks on the Fortress. The tower was built both to secure the hill and protect the entrance to the bay. The tower's name was later changed to Torre d´en Penjat, or Hangman's Tower. To protect the harbour of Fornells, the British built a tower on the rocky headland overlooking the harbour's mouth, and a small tower on the island of Sargantana. They complemented these two towers with two more small towers nearby, one at Sa Nitsa and one at Addaya. Lastly, the British built one tower at Santandria to protect the old capital of Ciudadela. In addition to the 12 towers that they built, the British made use of three towers that the Spanish had built earlier. In 1781, Captain Francisco Fernandez de Angulo had built towers south of Port Mahon at Punta Prima and Alcaufar, based on the design of those that the Spanish had built in Gando, Gran Canaria, in 1740. Following the Treaty of Amiens Britain returned Minorca to Spain in 1802. Around 1804, the Spanish built a tower at Punta Na Radona to protect the beach at Son Bou, Minorca. Four years later, in 1808, Captain Lord Cochrane, commanding the 38-gun fifth-rate frigate HMS Imperieuse, sent ashore a landing party that destroyed the unarmed tower.